Dominic Rubio and Michael Cacnio, two of the most renowned genre artists in the country, collaborated in a successful exhibition at Galerie Stephanie last year where they played off each other’s individual practices in painting and sculpture. The exhibit was such a success that they decided to team up with another genre artist, the legendary Modernist Master Angelito Antonio, to conceptualize an exhibit centered on the theme of musicians and music. The theme was something all three artists could relate to. It was Longfellow, after all, who said that music is the universal language of mankind. This simple truth nonetheless carries the weight of importance, as music is an art form that defies borders and cultures. Alas, its fleeting nature stands in stark contrast to the ability of other artforms to archive their expression. While recordings may exist, for instance, of a peerless singer or a virtuoso violinist, their live performances – undoubtedly the best experience of any kind of music– will only last as long as the artist’s own mortality will allow. Visual art, on the other hand, is an artform known for permanence. Visual artists are able to capture the evanescent from a completely new perspective, and thus preserve a part of its essence. 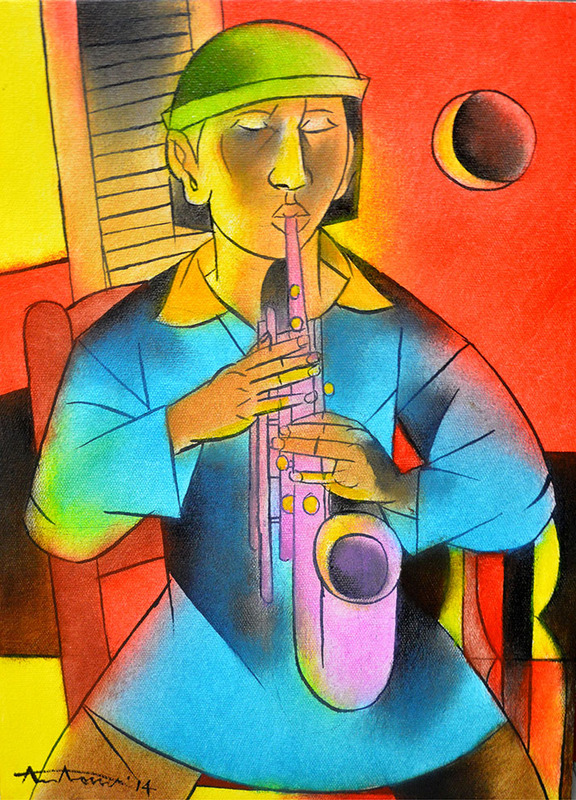 When they paint music and musicians, they capture what is inherently transitory and imbue it with new meaning. Inspired by this, Rubio, Cacnio, and Antonio present “La Musique,” a new exhibition at Galerie Stephanie in Libis that displays new works that attempt to visualize the impact of music on its listeners. Opening at 6PM on October 2, 2014, the exhibition will run until October 16. Galerie Stephanie is located at Parc Plaza Building, 183 E. Rodriguez Jr. Avenue (C-5), Libis, Quezon City. They may be reached through their landline at (632) 709-1488 or email at inquiry.galeriestephanie@gmail.com. Renowned painter Dominic Rubio has participated in several exhibitions in and around the region, including shows in New York, Hong Kong and Singapore. Rubio’s signature aesthetic technique of elongating the necks of figures from the Philippine colonial period has made him a critically acclaimed artist and a staple of international auction houses. 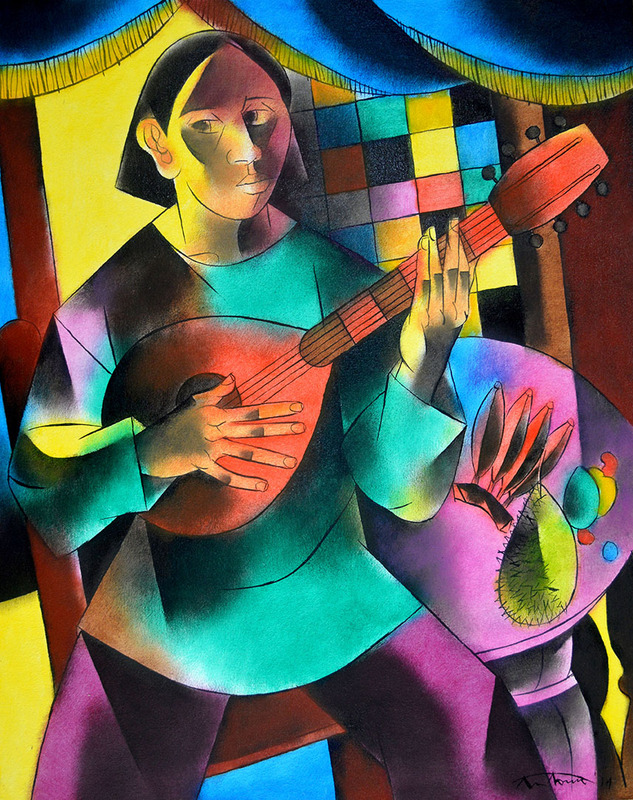 A graduate of the Fine Arts program of the University of Santo Tomas, Rubio is one of the most celebrated visual artists today—with no less than art critic Cid Reyes to comment: “Arresting is the punctilious application of pigment and the delineation of the figures…technically adept, Rubio displays impressive workmanship.” In Rubio’s practice, the nostalgia is brought forth in his treatment of the subjects and the colonial contexts he places them in. Rubio’s consideration of the theme is in the tinges he brings in his details. A brilliant character painter, his subjects in this exhibition are musicians of a historical leaning – painted playing period instruments, such as the Chinese violin – and therefore wear the details of their historical time-period—costumes, equipment, and hawker-stands all conform to an idyllic reimagining of the past. 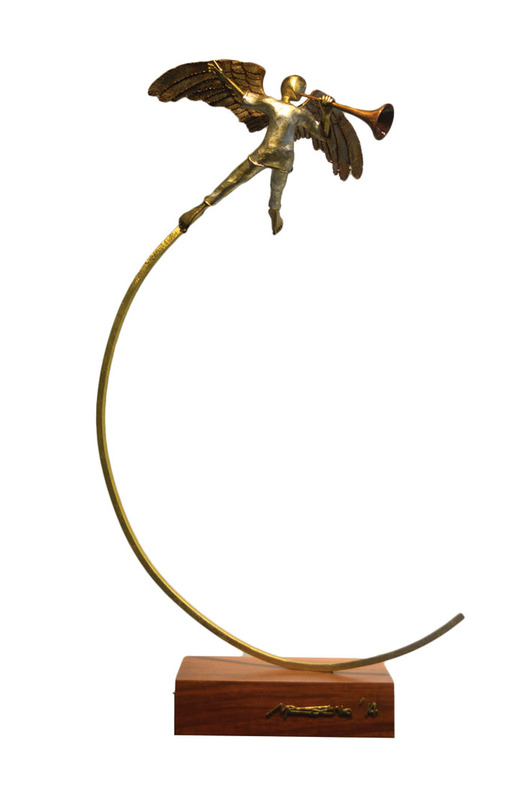 Michael Cacnio, on the other hand, is perhaps one the foremost sculptors in the country today. Having had over 50 sold-out solo exhibitions in the US, Europe, and Asia, Cacnio’s candid depictions of tableaux scenes of Philippine genre has been noted by critics as representing the best of genre in sculptural form. 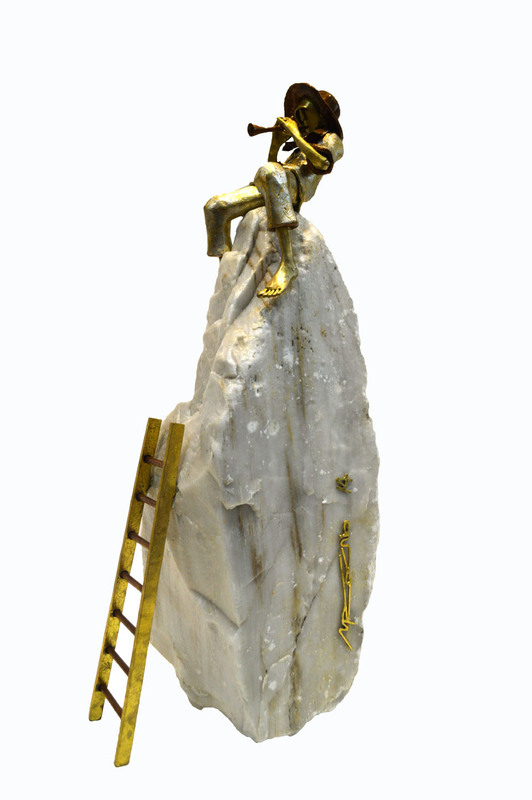 The artist has achieved a fair measure of awards in his 26 years of sculpture, including the 2006 Ten Outstanding Young Men (TOYM). A product of the College of Fine Arts at the University of the Philippines, Michael Cacnio is also the first – and so far only –Filipino artist to exhibit at the Berlaymont in Brussels. The appeal of Cacnio is in his ability to skilfully capture the Filipino way of life. 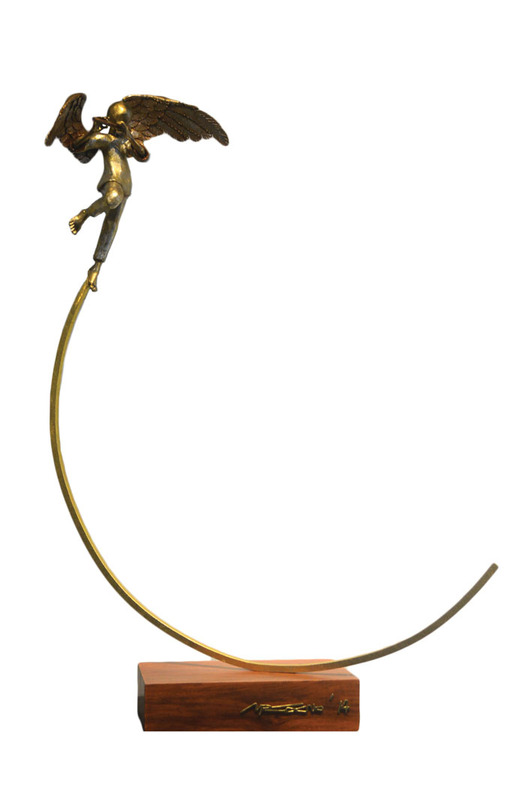 Cacnio is highly sought-after for his genre sculptures of brass and glass. The artist takes a wistful image of bygone time and asks his audience to reminisce about the idyllic life of the rural past. His work is stunning, with figurations in poses that capture both motion and fluidity. Angelito Antonio has an art career that spans almost half a century. Studying visual art at UST, Antonio was colleagues with National Artist Ang Kiukok, Antonio Austria, Danilo Dalena, Mario Parial, Jaime De Guzman and Norma Belleza. His teachers at UST included National Artist Vicente Manansala and Galo Ocampo, who not only awarded the young Antonio a scholarship, but gave him a teaching position while still a student—a position Antonio held for a decade after graduating. The artist has more than 20 local and international awards to his name, and is one of the original members of both the Art Association of the Philippines (AAP), and the Saturday Group of Artists. Some of his awards include the Grand Prize (1965) and 3rd Prize (1963) of the AAP’s annual art competition, and 2nd Prize at the Shell Art Awards (1962). Already an immense figure in the history of Philippine visual art, Angelito Antonio’s practice continues to develop and change—the result of a keen mind that is determined to take his practice to ever-higher planes. The consequence of this evolution is that every exhibition of Angelito Antonio works builds from the last—while Antonio’s earlier works were more defined and boxed-in, his later works see him moving towards abstraction, or a mix of abstract and figurative concepts. In this sense, Antonio has become perhaps one of the last pillars of Modernism, adhering to Modernism’s core tenets of dynamic expression. The artists revel in the ability of music to sooth one’s soul. 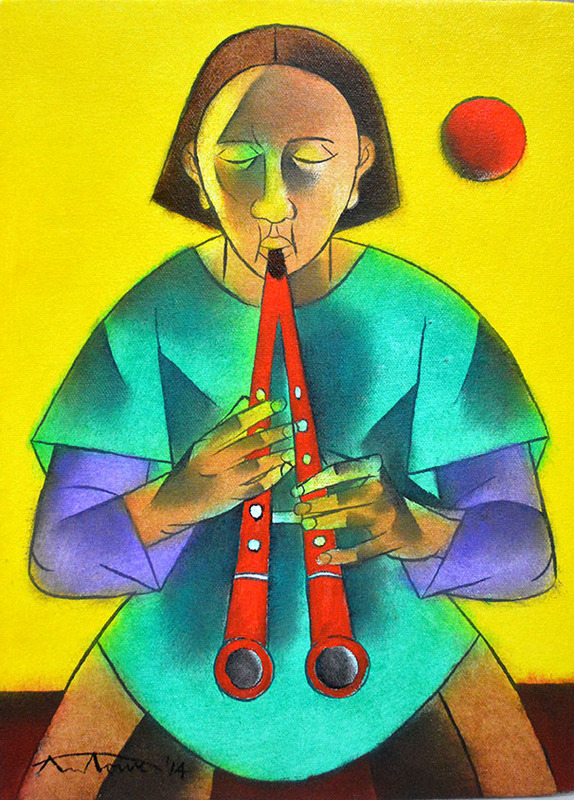 In “La Musique,” they effortlessly capture what composer Leopold Stokowski said, that “…musicians paint their pictures on silence.” It also showcases the talents of three genre masters in their prime, enticing anyone who is interested in their practice to attend the exhibit this October. 45 x 24 x 11 in. 43 x 29 x 13 in. 25 x 6 x 9 in.